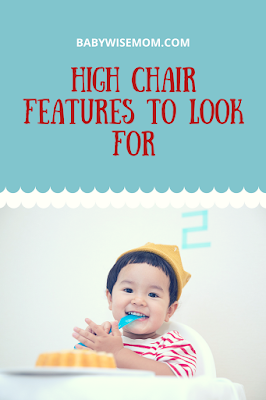 A lot of people wonder what to look for in a high chair. There are so many possibilities out there! First, you need to decide what you want it to be able to do, your space available, and your budget. When Brayden was ready for a high chair, we bought a booster seat that was portable, had a tray, and could recline. It turned out to not be the best thing. We did get use out of it, however, when Brayden graduated to a booster seat from the highchair at 18 months. At 6 months (started solids at 4 months), I got a highchair. He started eating a lot more and I attribute that to the fact that the highchair was a lot more comfortable so he would sit in it longer. Shortly thereafter, he started sleeping longer for his naps. Are the two related? It is impossible to say for sure. At the time, that is what attributed the better naps to. 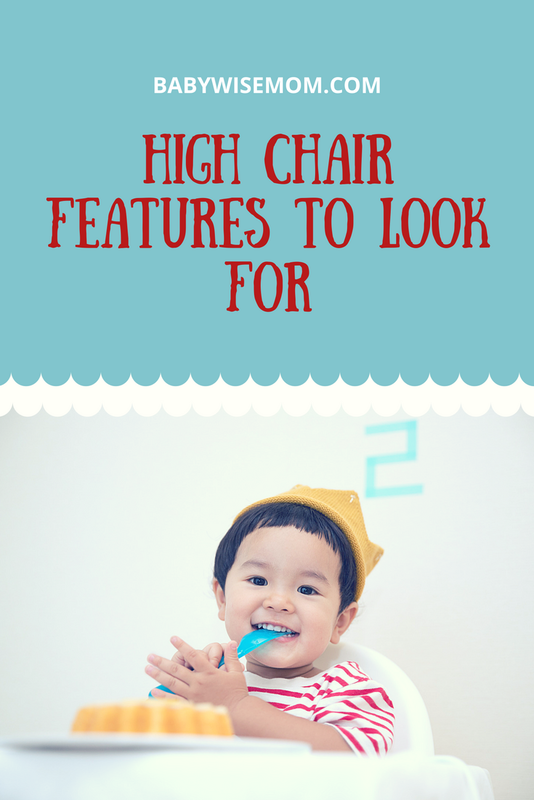 So, here are the qualities I recommend for a highchair. It is personal preference and people like all types, but here are my opinions. The back of the seat is not straight across but is more like a U or smile shape–curved. This seems to prevent the baby from sliding down. The booster I got that I didn’t like was straight. The old high chair I use at the in-laws is straight. Both kids are/were falling down in such things. If you plan to have more young babies use the chair, one that the back reclines. The need for this is dependent on the child and on the age you start solids. Kaitlyn has been sitting up straight in hers since before 5 months, but I do have friends who have had babies not be able to sit up well past 6 months old. I like the option, and I would put Kaitlyn in the high chair before she started solids so she could join us at the table for meals. A tray that you can put in the dishwasher (if it is one that would have a tray). Mine has a cover that you can put in the dishwasher, and some have two or more. I wouldn’t mind two because then while one was being washed the other one is being used, but honestly you would only have one meal time while the one is being washed and the main tray is getting dirty, so it isn’t all that inconvenient. An easy-to-clean seat pad. Some are fabric that can be washed in the washer, some are plastic that can be easily wiped off with a washcloth. I can see benefits to both. It is going to depend on you and your cleaning preferences, but watch for one you can easily clean. Mine is plastic coated, but I will put it in the washer at times–I just don’t dry it and I wash it the same way you would wash a plastic shower curtain liner. If you live in a small space, one you can fold up compactly and put in a closet could be nice, but I would only get that if you would really fold it up constantly. I know I personally wouldn’t fold it up. You are using it three times a day for meals and some babies will sit in it to play while you make dinner or whatever, so it seems inconvenient to me. If you would want to put it away for company, you could likely find a place to store the highchair while they were there. Most fold up, some just more compactly than others. My mom’s is one that folds up very compactly (at the time it was the smallest on the market, I am not sure if it still is). But she honestly just keeps it out all the time. The highchair itself is not as roomy for the child so it isn’t one I would recommend for long-term use, but Brayden at 2.5 can still fit in it just fine. Wheels are nice if you plan to move it around a lot. I think most have wheels anyway. Toys are nice for the child’s entertainment, but you could put toys on the tray if you want them to play in the highchair. My booster had some toys on the tray, but they were things you pushed to make other things happen, and it is hard for an adult to push, much less an infant. Mine has a basket under the seat; I keep bibs in there. It also has a bar on the back where you can hang bibs or wash clothes…conveniences. As I said, there are all types out there and each one is like by someone for some reason. Determine your desired uses and go from there. These are just features I personally like. What high chair do you have that has a basket under the seat? That’s a wonderful idea! I was trying to figure out a way to rig up one for mine. I have the Chicco– which I love, but I could do something with all that wasted space underneath!! I hate having to run to the kitchen or his bedroom for towels, bibs, etc. I have a Graco high chair, but I looked at their site and it looks like they don’t make the one I have anymore! It doesn’t look like any of their high chairs have baskets anymore. You might be able to find it if you looked on ebay or something. Hi there! I guess I can't believe there are not more questions under this topic. Maybe it's just my little guy who has found his vice big time. He's 14 months old. We have been trying to work with him not throwing food for months now. He doesn't just throw to signal that he is done. He takes a bite and throws food while chewing. Take a bite, and throws more food while chewing. I consistently firmly tell him no, and have just started a little hand slap. He looks at me like he understands, but doesn't stop. I have avoided removing food and taking him out of his high chair because I we struggle to get him to eat enough as it is. In fact, we are still following some of his meals with thick pureed baby food because sometimes he just prefers that. Is he too old for that now? Should I just let him go hungry and hope he learns to eat what's there? I avoid snacks and sweets to not spoil is appetite. Thanks for your time! Hi like everyone else I love this blog! BW is a great foundation but leaves lots of questions in practice! My question is that I just ready BW Book Two and am wondering about high chair manners. My son is 5 mos and I am planning on EBF for another month. Now, in book two it gives advice for bad behavior (i.e. raspberries, throwing plates etc) but for babies older than 10 mos. What I am wondering is what do I do with my son if he displays bad behavior before he's 10 mos old? Do I do isolation time in his crib if he consistently has bad behavior? I haven't run into any of this as we haven't started solids yet but I want to be prepared. Thanks! Thank you for your blog! I Feel like I've read everything and still have questions. I have 3 month old b/g twins. They can fall asleep in their own perfectly and sleep really well at night. My problem is the 45 minute intruder at nap time with my girl only. She naps in her RNP because of reflux. Sometimes she needs to burp or spit up but I can't get her back down. I really think the cause of her waking is she is bothered by the sleep cycle change. I've tried rocking her back to sleep, turning on the vibration on the RNP and giving her her paci. Nothing works. I put her in the swing and she stays awake. CIO in 5 minute intervals lasts the remainder of her nap time then she's just too tired to stay awake after her next feed. The only way I can get her back to sleep is to nap with her. This is establishing a terrible habit but it's all that works. This has been going on almost a month now. Our schedule is 7:30 am wake, 10:00, 1:00, 3:15, 5:30, 7:30, 11:30, 4:30. I've tried a 3 hour schedule during the day but they won't have it. The cluster feeds also work well for them in the evening but it puts them having 5 naps a day. I'm about to drop a night feed when they reach 11 pounds. They stay awake for about an hour then go down for their nap. I've played around with wake times and make sure to not miss sleepy cues. Do you think my schedule is causing poor sleep for her? Should I have her CIO at nap times? What are your thoughts? I'm so desperate. I have to keep the babies on the same schedule.